Every floor is home to four suites, each home to 8 residents. Residents in a suite share a common area with couches and desks, and each is allotted funding each quarter for social outings and activities. A standard CRC double room. Rooms are an essential part of the CRC life if you're a resident, as it's sort of the place in which you actually sleep at night -- unless you end up sleeping in the suite couches, which we really don't recommend. Around ⅔ of residents live in a double room, shared with another resident. These will come with two beds, which may be lofted, but not bunked; two desks; two chairs; two closets; and two pairs of wastebaskets, one for recycling and one for other waste. The rest live in singles, but most of the single rooms are taken by upperclassmen during the room allocation process. A few freshmen do get to live in singles on the third floor every year. Our rooms are on the smaller end of the list of Northwestern's campus housing sorted by usable floor space. The standard double is 14.5 feet by 11.5 feet, although certain rooms are slightly larger or smaller. The single rooms tend to vary in size based on floor and location. All rooms are equipped with air conditioning. You're not going to need it for most months of the year, but it is useful in May and June when the temperature returns to acceptable levels again. Each suite is connected to three or four double rooms and several single rooms. These surround a shared lounge space, equipped with sofas, chairs, tables, and desk lamps. While each room is part of a specific floor and suite, all suites are open to all members of CRC, and people often spend time hanging out in each other's suites. The lounges often end up as the center of social interaction and exam review during the course of the academic year, by offering a smaller community within the larger social group of CRC. 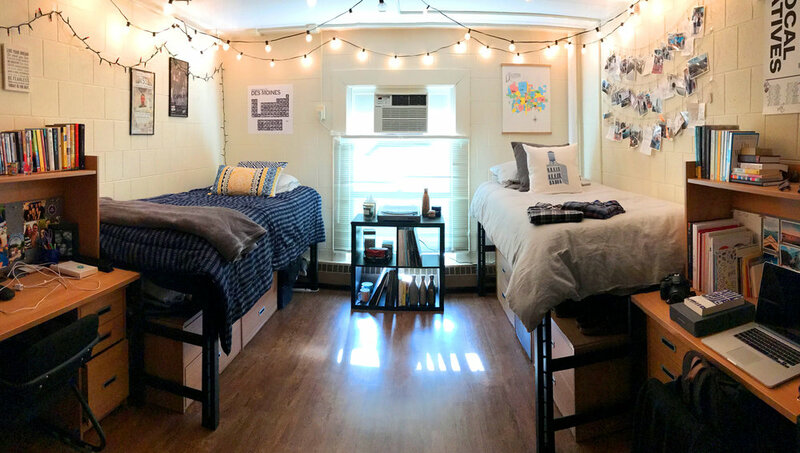 The suite system also helps if you aren't best friends with your roommate, or if you live in a single, by offering an additional space for socialization. CRC's suites are mixed-gender on the second and third floors. The suites on the first floor, however, are segregated by gender. The building has no provision for gender-neutral or gender-non-specific housing. Most of the Communications Residential Building's extensive collection of rooms are located on the ground floor of the building. Facilities are open for use to all members of CRC, subject to policies published by the executive board from time to time. The main lounge is the center for all residential-college-wide activities. CRC's all-college meetings take place in the main lounge on Sundays. In addition, the room can be used by any member of CRC to hold their own meetings and practices. The main lounge has a small grand piano, couches, the largest kitchen in the building, and a television with cable channels. The BSR is the larger of our screening rooms. Located off the main lounge, the screening room has an HD projector and a fifteen-foot wall screen, and is outfitted with sofas and chairs to make it one of the best places for a medium-sized group to watch films anywhere on campus. The room also has a Wii and Xbox, and plays host to most of CRC's video gaming tournaments and events throughout the year. The TSR is the smaller of our two screening rooms and feels less like a theater and more like a living room. The room has a coffee table, some couches, a pair of tacky pillows, and a projector with connectors for laptop computers and a blu-ray player. The Radio Room, exclusively managed by the Radio Room Chair, is perhaps one of the most mysterious of CRC's open-to-all facilities. Every year, the Radio Room is the center of life for Radiothon, CRC's annual 50-hour radio broadcast fundraiser. CRC even has it's own game room! By the TV lounge, we have a pool table, air hockey, and a ping pong table (not pictured), so you and your friends basically have your own arcade. If you're looking to wind down after a long day of class or have a movie night in, the TV lounge on the ground floor is a great place to crash, with a DVD player and cable connected. CRC also has a computer lab, equipped with a Windows PC for those times when your personal computer stops working. Also known as a gym. For those winter nights when all of the campus gymnasium facilities seem too far away, but you will want to get a couple of minutes of cardio today. Opposite the Radio Room is CRC's study lounge. It's a small but cozy place, and has plenty of desks and comfortable chairs for all those nights when studying needs to happen but it's too cold to go outside. You're going to need this. There is a room on the ground floor for residents to store their trunks and other large, bulky storage equipment. Access is controlled by the Residential Assistants, and often the room will be opened during the start and end of every quarter. CRC has a bike room for you to store your bicycle, which becomes especially useful when you don't want to cycle over the winter. You don't need to worry about your bike getting stolen, and you don't need to pay the bike storage fee for the service offered by the University.